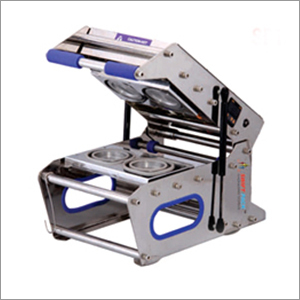 Similar to our meal tray sealer, we are also providing a cup sealer machine. We at Shri Vinayak Packaging Machine Pvt. Ltd, offer Cup Sealer ideal for packing of industries, such as beverage of pearl milk tea, bubble black tea, soybean milk, soup,cup water etc. Cup sealer can be tailor-made for sealing container in all kinds of shapes, including rotundity, bowl-shaped, rectangular, square, hexagonal and oval. Easy to operate, energy efficient and cost effective, the vacuum packing machines offered by us are available in different models to diverse applications. We are providing with two different models with similar features but with different cup diameter and film size. A highly convenient piece of equipment, the cup sealer is available at a reasonable price.